All that glitters is not gold as the New Zealand team found out with two outstanding bronze medals on the opening night of the UCI Track Championships in Melbourne tonight. The men’s team pursuit quartet of Marc Ryan, Sam Bewley, Aaron Gate and Westley Gough rode a splendidly judged race to claim the bronze medal over Russia, after being behind by 1.5 seconds at the halfway mark in the 4000m race. The burgeoning men’s sprint team needed some fortune before edging out Japan to win the bronze medal. The trio of Ethan Mitchell, Sam Webster and Eddie Dawkins had ridden a significant personal best of 43.742 to be fifth fastest behind the four superpowers of France, Germany, Australia and Great Britain. But Great Britain and Germany were disqualified for infractions at the changeovers elevating the kiwis to the bronze medal ride, where they edged out Japan. Tonight was only the third medal won in the team pursuit at the world championships and the third bronze for Gough and Ryan who were in the pursuit combinations that won bronze medals in 2009 and 2010. “We got our pace judgement must better tonight. That was a really good ride,” said Ryan. “This afternoon we went out too quick by about 3/10ths of a second in the third and fourth laps and paid for it later in the ride. “Tonight we were that bit more measured and that meant our guys who had the lap and a half stints later were well set. “To think we have so much depth with Pete Latham on the sidelines who could have easily ridden and Jesse Sergent still to come back into the squad. They dropped behind by 1.5 seconds at the 2000m mark but gradually put the pressure on, closing in after a Russian rider was dropped to zoom home in 3:57.592. The men’s team sprint were delighted with their qualifying effort in 43.742, which was their first time under the 44 second barrier. They were almost into their recovery mode when given the news of their elevation and they produced almost a mirror image ride of 43.812 to edge out the Japanese by 8/100ths of a second. Hosts Australia came from behind to pip France by 1/1000th of a second to win the gold medal. “We have been challenging that 44 second mark for a while so to beat it twice in one night is great,” said Dawkins. “We’ve reduced out best time by nearly a second in two years and now we are less than half a second from the gold medal. “The rules are pretty clear on changeovers and we practice it all the time. They are very experienced teams and know the rules and we were able to take advantage. Earlier the brave Olympic bid by women’s sprinters Katie Schofield and Natasha Hansen came unhinged at the start of their time trial. Schofield slipped out of the starting block and nearly fell, and while she recovered well, the chances of a world class time had gone. Hansen produced a stunning second lap for a 34.278 effort, their second best time, for 10th placing. The BikeNZ squad produced a rider for the future when 18 year old Alex Frame from Christchurch finished an outstanding fourth place in the men’s 15km scratch race, won by Team Sky sprinter Ben Swift. Frame, brought in to the training camp last month, made the most of his chances and was elevated to the team for experience, and he produced a race of intelligence and integrity. Two medals in the opening night is an outstanding start for the BikeNZ team with strong chances tomorrow in the women’s team pursuit, Simon van Velthooven and Alex Frame in the men’s kilo time trial and Shane Archbold in the first day of the omnium. Women’s team sprint, qualifying: Germany 32.680, 1 (world record); Australia 32.752, 2; China 32.937, 3; Great Britain 32.941, 4. Also: New Zealand (K Schofield, N Hansen) 34.278, 10. Gold medal ride: Germany 32.549, 1 (world record); Australia 32.597, 2. Bronze medal ride: china 32.870, 3; Great Britain 33.160, 4. 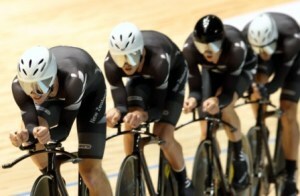 Men’s team sprint, qualifying: France 43.247, 1; Australia 43.512, 2; New Zealand 43,742, 3; Japan 44.039, 4. Note: Germany and Great Britain disqualified. Gold medal ride: Australia 43.266, 1; France 43.267, 2. Bronze medal ride: New Zealand Japan. Men’s 4000m team pursuit qualifying: Great Britain 3:54.485, 1; Australia 3:54.654, 2; New Zealand 3:59.156, 3; Russian 3:59.290, 4. Men’s 15km scratch race: Ben Swift (GBR) 1, Nolan Hoffman (RSA) 2, Win Stroetinga (NED) 3. Also: Alex Frame (NZL) 4.